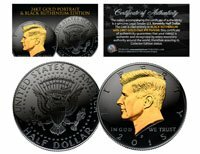 • Authentic 2018 U.S. JFK Kennedy Half Dollar. • Genuine 24KT Gold Plated Massachusetts State Quarter. • Each Coin set in Acrylic coin capsules with display stands. • Features the sayings "One of the Greatest Teams Ever" and "119 WINS!". Here is your chance to own a Boston Red Sox 2018 World Champs set of two (2) colorized United States coins. This 2-coin set includes a beautifully colorized 2018 JFK Kennedy Half Dollar which features the Boston Red Sox as 2018 World Champions. The second coin is a 24KT Gold colorized Massachusetts Statehood Quarter featuring Boston's 119 WINS! These high-quality, genuine Legal Tender United States coins have been colorized using a unique painstaking multicolor authentic process by the Merrick Mint. The 2-coin set comes with a Certificate of Authenticity to guarantee that your coins are authentic and recognized by every monetary authority around the world, assuring its Collector Edition status.